Instagram analytics is without question a remarkably powerful tool. So how do you find good.. and I mean the really good analytics for Instagram ? Well that’s what we’re going to talk about today. While the Instagram website is a social media powerhouse, many users have no idea about what is effective and what isn’t before creating an account and even while using their platform. If there’s one thing that I have learned online over the years is that regardless of the platform (social media or not), knowing the analytics is a “must” and without it, you’re flying blind just hoping for the best. Instagram tools such as the one that I am going to discuss in this post is a top tool that any Instagram user should use for Instagram keyword discovery, website monitoring and more and you need only look at the examples that I will show you to truly understand and come to grips with just how incredibly powerful this information can be and what it means for your potentially massive success online. With that said, since pictures are media and considered a very critical component of what we do as bloggers, it’s no wonder why everyone is jumping on the Instagram bandwagon right ? Do you realize that it’s possible to basically reverse engineer the success that other users on Instagram are seeing ? It starts with knowing what keywords other Instagram users are targeting and then ensuring that you target the same keywords and follow basic SEO rules to optimize your Instagram activity. The secret is in the Instagram analytics data that indefinitely set you apart from those who have competitive intelligence data (otherwise known as analytics data) and those who don’t. The right tool(s) in your arsenal will put you miles ahead of the bloggers and website owners that don’t think analytics matter. It doesn’t matter whether we’re talking about local business that focus on local SEO or a blogger who blogs as a hobby. We all want our content to be seen and a ridiculously huge ingredient in this secret sauce to getting it done is in the analytics.. plain and simple. Let’s consider the following. On Instagram you can associate a photo with just about any niche right ? I’m not sure what kind of blogger you are or may be aspiring to be or what your niche is, but let’s focus on the food blogger (just as an example) for the purpose of today’s post. Tons of pictures for this niche right and tons of food bloggers out there too, so again to reiterate.. it is truly a great example to look at for the purposes of discussing Instagram analytics. Either this looks really attractive to you or it doesn’t, but it should and here’s why. NOTE: If you’d rather just skip the rest of this and get right to it and you’re ready to discover and start using what is quite frankly a truly life changing analytics tool, just click the button below to start using it for free or go with a paid plan. However, if you’re still reading, let’s talk about our next example where you can see that there is no particular sorting so what I’m going to do now is sort by search volume. I love volume just like the next person when it comes to analytics. What are the big terms to go after and alternatively what are the low hanging fruit terms as well, but we’ll focus on the larger volume keywords as you’ll see sorted in the next image. The page that it’s associated with is seen below has over 2800 posts and 2.9 million followers. What this tells me is that it’s going to be pretty hard to rank for this term according to the analytics data that I’ve already seen through an Instagram account, but the other reality is that this is also a branded keyword. The page that is associated with it is showing only 315 posts, nearly 2500 followers and only following 16 users on Instagram and again we’re talking nearly 50,000 searches a month and in Google it’s ranked in the middle of page 2. This is a much easier term to rank for through Instagram and the search volume is pretty impressive as well. With this tool, there is no guesswork. It’s no magical. It’s straightforward Instagram analytics data that can propel your success and visibility online for keywords you want to target through the Instagram website. The next thing that we’re going to do is sort by position. This is absolutely sensational because we can see according to the data we’ve been able to collect pertaining to Instagram analytics what Instagram pages and keywords are ranking in the top positions organically in Google. What you see here is pretty mesmerizing because not only have I sorted this by position, but I have also added filters to my search that include the keyword that I wanted to find results between pages 1 and 2 of Google and that I wanted the search volume for anything I got back from the report to be greater than 500 searches a month. 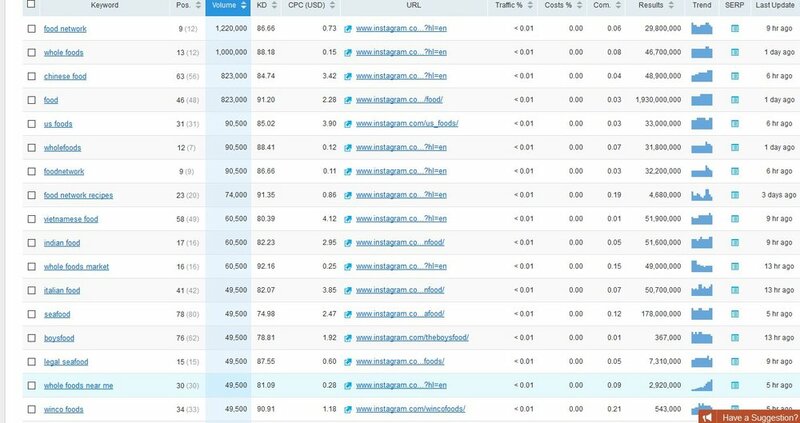 We’re literally talking laser targeting type of Instagram analytics data on Instagram.com for any keyword I want to look at more in depth. This is analytic data that you can use pertaining to Instagram analytics to figure out what keywords do I target for my Instagram account. This is the kind of data that can be used for any website that is registered online. This is information that can provide remarkable insight into what your competitors are doing. This is Instagram search and analytic data that if you’re on Instagram can transform your Instagram success. Additional insight that I will share with you is that I use this tool personally for all my keyword and analytic data and highly recommend it. You can use this tool for free for 7 days to witness and experience just how reliable, authentic and powerful this really is. Thanks for reading. If you liked the post, please use the share buttons below. Ever look at your website and feel like you were so tired of your domain ? I mean lets face it.. coming up with a domain name isn’t the easiest thing in the world to do. On top of that, more than likely the one that you wanted at first was probably in the hands of someone else that managed to perform a domain search long before you were contemplating the domain name that you’re interested in now. Worse yet, some of those people are domain registration squatters. You know those individuals that buy domains just to sit on them for years to wait for someone that really really wants it and will offer them some outrageous amount of money to own the domain name. The name – is this going to be good for my business and my purpose. Is this good for branding ? Is this name brandable ? Age – Do I really have to start from scratch with my domain name ? If you do, that means zero age in the eyes of Google. That means zero backlinks in the eyes of Google. That means zero trust and zero power. That ultimately means a tougher ladder to climb and a harder path with respect to competing with your competitors. Domain Extension – What is going to be the best choice amongst all the available domain extensions ? The traditional, proven, and more recognized extensions such as .com, .net, .org or do I opt for something new with less saturation and less credibility and trust not only in the eyes of Google but from the visitor perspective too even if it means getting the name that I really want. Expired Domain – Do I buy someone else’s name and make it work for the niche that I’m trying to break into ? This means inheriting everything that’s happened to that domain before I took ownership of it. That means inheriting the good and bad including any penalties which basically means the possibility of rehabilitating the website until it’s healthy enough for my purposes. I know it’s a lot to think about, but the good thing is that you have insider information to think about as you come up with a gameplan for how to proceed. With that said, the first time I bought a domain, I had no idea there was so much to consider. I just blindly came up with a list of names without any thought to age, competition, extension or anything. Needless to say, there’s a lot that I’ve learned since then. Now I know that this conversation regarding the domain name started with what happens when you get tired of it. You’ve heard me mention redirections on my blog topic ideas post and my brief post on sneaky redirects and know that I’m not a big fan of it, depending on how it's done, but either way there are certainly times when considering a redirection makes sense. The kind of redirect for a domain name that is most common and makes the most sense is called a 301 redirect. The Search Engine Journal, Matt Cutts and notably many others have talked about this type of redirect. Nevertheless, one of the best options for this in staying in line with the purpose of this post is for a website owner to redirect their currently owned website to another domain by way of a 301 redirect. The Search Engine Journal, a very notable and respected avenue online for search engine related information notes that this is something that every SEO should know about. Beyond my own thoughts on the matter, SEJ has said in it’s advice on 301 redirects that 301’s are good for passing link juice (e.g. authority), page rank when it was still being updated by Google. Additionally I would add that it also helps in maintaining your traffic and / or traffic sources and in giving credit to links that you’d already acquired to the new domain instead of having to start all over in regards to the website authority and the backlink portfolio as long as the 301 redirect was done correctly. A 301 redirect can be done to an entire domain whereby you signal to Google that the domain name has changed and that the whole domain including it’s contents and sub-contents all need to be forwarded to the new domain or you can do this for individual pages. The best way to think of this is that the same way a person completes a change of address for their home is basically the same thing that you’re doing for your website. You’re saying hey, the old website lives here now, hence the 301 redirect to the new domain. Just as I had mentioned before about doing this correctly, on the other hand if a 301 redirect is done incorrectly, Search Engine Journal remarks that you can lose rankings, authority and backlinks. 301’s are risky, but when they are done correctly, you can take a brand new domain (and we’re not talking about buying up an expired domain) and transfer everything you’ve been credited with in your existing domain to the new domain that you are moving to. In the case of Toys R Us, they redirected their website to Toys.com and ran into a lot of trouble. It was truly unwise in the first place. The plan was to try to rank for a keyword phrase for which they were already enjoying a top ranking for in Google anyway. Upon doing their 301 redirect not only did their new domain get delisted from Google, they lost rankings from their existing website alongside a host of other issues associated with this poorly executed plan. Don’t let this happen to you. Make a gameplan for your 301 redirect prior to executing it. As long as it is done correctly, the new domain name will safely receive all of your hard work, brandability, links and power. At first glance, the notion of buying expired domains doesn't really seem all that appealing. it's not uncommon for a newbie to think, huh ? expiring domains ? who'd want that ? But oh contraire, you'd be surprised that there's quite an audience for such a thing and that audience and interest has grown over the years. Buying an expired domain is like buying someone else's home. You don't want to just say hey that one looks good, offer some cash and call it your own. Just because a domain looks good doesn't mean that it's "all good" I assure you. However, lets back up a little bit. Let's talk about why you would want one in the first place. Google is the king of search engines.. there's nothing new about that reality. However, if you're going to have a chance at competing in the search results if you're a blogger, buying an expired domain is going to give you an advantage over buying a fresh domain that has never been used or tested before. While the list may seem small, these five items take years to build and while you're building up your street cred, your competition is only getting stronger and stronger every day, every week, every year. When we talk about domain authority, an easy way to think about this is to look at it as the muscle in a website. New domains simply have no muscle and that means trying to outrank your competition for more competitive terms will be very difficult. It's not that it can't be done, but the work ahead of you will be steep. Alternatively, if we're talking about an expired domain, a level of authority is likely to already be there, but that's not guaranteed either. It may seem confusing when I say that, but it depends on the domain that you are you looking at. Many people use a reliable option like godaddy auctions for this purpose. That authority is going to be linked to the backlinks, age and trust of the website.. all of which make them a force to be reckoned with. On the matter of backlinks, new blogs don't have any. Building links too fast for a new website can actually hurt the website. Often times we hear that Google wants you to build up your website naturally, but this needs to be done slowly, however you can always pick up the pace as the blog matures over time. On the flip side, in the case of an expired domain, backlinks are bound to already be there which can significantly lesson the work that you have to do with respect to your own link building efforts and overall backlink portfolio that you will ultimately be maintaining depending on how many links have already been built. This is very appealing, especially if you're someone that doesn't want to go through all the painstaking work of starting from scratch. On the matter of age, this is is fairly significant because if you weren't aware, Google does place a lot of weight on website age. As a new blog, it's very clear that you're starting on the ground floor. The best way to look at this is that you're the newborn amongst all the other young adults, grown ups and senior blogs out there online in the blogging world. With that said, the only way to build up your age very quickly when you get started is to acquire an existing domain. When you find expired domains with age, this can propel you ahead of the pack and competition that are vying for the same short tail and long tail keyword phrases that you're after. If I know that some of the more competitive keywords that I'm interested in are being ranked by blogs that are 5 to 10 years older than my blog then I'd look for an expired domain that is within that age range so that it evens the playing field a bit and also decreases the work that I will have to do to rank. In an expired domain auction, it's not unlikely to find auctions for websites that are 10 years and older. Considering age is such an important ranking factor in the eyes of Google, this is something to give some real consideration to. Imagine having Google as your best friend. Whoa.. what a concept right ? Well if that were true, then you could literally rank all day and night for anything you could dream of.. Google would be your oyster and all would be great in the world, but such a reality doesn't exist for most of us. With that being said, if you're a new website, establishing that trust is very hard to do. Why ? Because, every day people are dumping blogs and websites and Google is quite aware of this. This reality that websites are thrown away every year means that you're going to have to prove to Google that you're here to stay for a while. Trust can be built by registering the domain for several years out alongside associating yourself with other websites that Google already trusts. If you're wondering about the websites that Google trusts, think editorially. News websites are good websites to latch on to because they are crawled often and are highly trafficked websites with very good metrics that take several years to establish. Expired domains can help you bite into the trust metric depending on what work has already been done on that domain prior to it going to auction. If you're fortunate, you may end up with an expired domain that already has years of established trust. Especially in the case of recently expired domains, a lot of that trust could still be there. Some of these metrics can fall off depending on how long it's been an expiring domain. You may also be wondering how to check on the history and other metrics of a website as you consider entering the market to buy expired domains. I would highly suggest using SEMrush or Ahrefs for this purpose. It's basically insider intelligence on any domain online. These tools can be very useful to see if there's been any work done on the expiring domain while it was owned by another registrar, reveal to you any backlinking that has been done, what anchors have been used etc. On this topic, traffic is obviously essential and without it, you may as well be on an island all alone. Registering a new blog means that you don't have an audience and what goes hand in hand is the reality that you don't have any traffic either.. meaning.. no one knows your blog even exists. Clearly, we want to change that and the fastest way to do that is to seek out expiring domain names that already have a traffic base. If you seek out these expiring domains they will be more expensive because they already have established traffic and it's plug and play. The greater the traffic, the greater the cost to acquire such expiring domains. It's fairly straightforward here in the realities that as a new blog or website, the newer it is the less likely you are to have any traffic from the start and opting to acquire an expired domain may make it much easier to establish traffic too. Nevertheless, in this conversation about expired domain names, keep this in mind. Expiring domains used to be the holy grail for many people looking to get ahead of the game of competing with more established domains. However, with the introduction of PBN's (private blog networks), acquiring expired domains has become much riskier now than it has in the past considering Google is actively sniffing these blog networks out and basically de-indexing entire networks once they've been discovered. So why is this part of this conversation ? Because, in the "unfortunate" event that the expired domain that you are acquiring has been a part of a PBN then you're ultimately acquiring an expired domain with a penalty which is the last thing that you want to do. Just as risky as this can be, there's a "LOT" of expiring domains that are free and clear and are just fine, but make sure to use tools like SEMrush and Ahref's to help you out in this endeavor. While I provide no guarantees, these tools provide an extra layer of protection for you so that you don't walk into a situation that you ultimately end up regretting. Private blog networks are often times networks established by buying aged and authoritative expired domains to rank other websites at a price and when the networks are discovered, the websites used for the networks go back to auction. Needless to say.. these networks have tainted the expired domains scene but additionally it can be said confidently, that they haven't ruined it. You just have to do a bit more investigative research to know what you're getting hence my SEMrush and Ahrefs recommendations. With that said, there are goldmines in recently expired domains and those that have been in the auction for a while that have quite literally just remained undiscovered so they are definitely work the look and worth your time. However, if you're like me and want something that is more about you developing a brand and find it hard to locate a good match during an auction for an expired domain, your only option may be to start brand new from the bottom floor and that is okay because success isn't determined by how old or young your website is. In 18 short months, this blog sees thousands of visitors per month so even though expired domains can give you an advantage, understand that achieving success can be done even if you're starting with a brand new domain too. 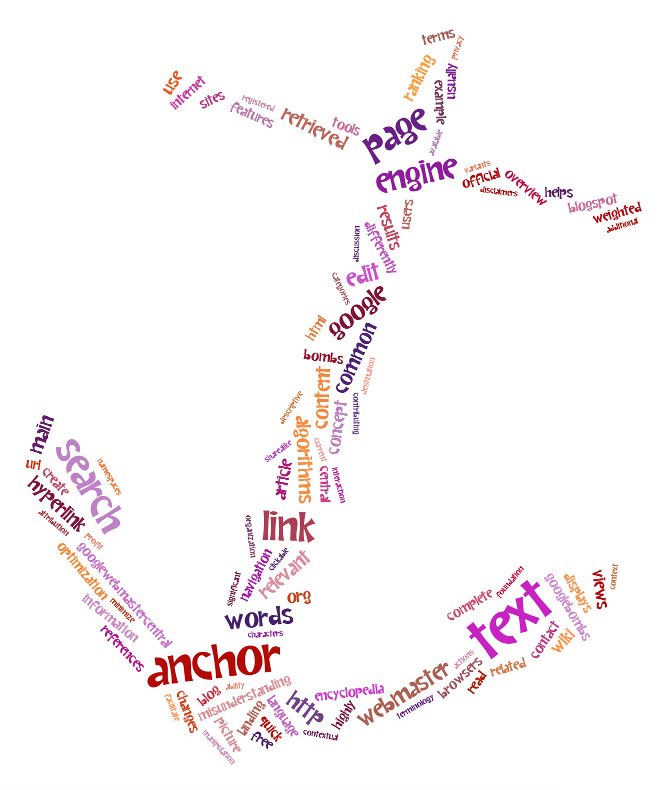 If you're new to SEO you may have heard of the term anchor text. Just as well I'm sure you're familiar with high velocity terms such as keyword research and SEO (search engine optimization) too. These are the staples in this industry and terms that you can't ignore much less read any article without hearing some mention of them either. With that said, obviously there are elements of high degrees of importance surrounding these phrases. Now of course Google has already had a thing or two to say about all of this and that message has changed over and over and over again repeatedly covering a span of several years. Nevertheless, here we are today still engaged in great debate and discussion over this too and truth be told.. that conversation and debate isn't slowing down anytime soon. One of the most basic questions when someone builds a website is how do I get a ton of traffic for different search terms ? Well the first thing that you want to do as I've talked about often on my blog is to do your keyword research. It can't be stated enough how important keyword research is when you consider how you want to define your blog post url, your titles and how you are going to write your content too. If you're not doing your research then you're missing out on a critical element that is needed in this conversation. This research absolutely leads into the development of your anchor text which we'll get into shortly as well. Now in order to get the basics out of the way, let me explain what anchor text is for those that may be coming across this post that are unsure. Lets assume that you want to target the keyword phrase "blog tips". Anchor text and keywords go hand in hand to some degree. Anchor text is best explained as the clickable text in a link (etc. hyperlink). So for our example here (e.g. blog tips) now highlighted in blue is hyperlinked as a keyword phrase to candidwriter.com. The anchor text is: blog tips. You may be wondering where the connection is in terms of keyword research to anchor text. Well if you were to do your keyword research, it would tell you whether there's anyone searching for that particular keyword. In this instance, having done my research, I know that the phrase that I've used in our example has a search volume of 390 searches per month and there are 739 million results for that search term in Google. Now for me personally, 390 searches doesn't fall in my "ideal" number of searches per month that I would like to target, but there are different things that can influence that from website to website in terms of what is ideal. For example, if you have a website or blog that focuses on selling a product that costs $500 dollars for each conversion or sale that you make, then approximately 400 searches per month would work quite well for you. Even if you converted a quarter of that traffic at $500 per conversion, you'd still be looking at making $50,000.00 per month. So while that is a digression from our true focus on this post, you can see that even search volume in the 300's can still be quite attractive depending on products associated with your content. With that said, I wouldn't get too caught up in low numbers. Analyze what opportunities exist for you to be able to capitalize and convert your traffic to help you determine the "sweet spot" for search volume that you should be targeting when you're doing your keyword research. Now even though I've given an example of anchor text, there are rules and best practices as well. In the example that I provided, what I did was use "exact match" anchor text. So in my research, I see that "blog tips" is highly aligned to the content on my blog right ? Well here's a little history for you. Prior to the Google Hummingbird update, websites would basically build links using exact match anchor text. So hundreds to thousands of links in website link profiles were build with the same anchor's. If you're truly familiar with Google and it's tendencies, anything that looks like link manipulation is a red flag and Google is always watching. So bear in mind that building anchors without any diversification is a really bad idea. These generic anchors won't have anything to do with any keyword that actually has volume, but it's a signal to Google that it's not being manipulated and those are signals that you want the search engine to see. Signals that reflect positively have a direct impact on how favorable Google views your website. With that said, now that we've talked about anchors and keyword research, how does this impact backlinking ? Here's a reality for you.. You can write as much content as you want. You can make your headlines as juicy and appealing as possible. You can publish that content "everyday", but if you aren't building backlinks then you're not going to get anywhere with Google. Everything that we've talked about prior to this all works together. Your research helps you to target keywords that are highly aligned to your website content. Your anchors reflect the keyword phrases that you've targeted and the backlinks that you build help Google to realize that you have different pages and different domains that are linking back to you for the keyword phrases that you are going after. As mentioned in our example earlier in the post about targeting "blog tips". I could go to a website like Quora and while answering a question, mention the keyword "blog tips" and link it back to a website page where I want to build backlinks to and once it's hyperlinked then credit is given for that link. On another note, determining whether this is dofollow or nofollow is another conversation altogether, but that's some insight into how the backlinking aspect of this conversation works. Again, we're not talking about link manipulation, but moreso how anchors, your key word research and backlinks process all works together. Linking is a natural and common part of the Google recognition process. I do not condone for one second going on out and going after a ton of exact match anchors as that will damage your website in the long run, but also realize that it's not uncommon to do "some" exact match in your own link building, but best practice is to do it sparingly and let people naturally anchor links to your website when they are doing the linking. As an SEO, having a SERP checker, website checker and rank checker all in one tool is essential and lets face it, that’s not so easy to come by in one package. Usually you end up with parts and pieces that work “okay” and kinda do the job, but somewhere in the mix, you always get let down, but not with SERPWoo or SW as you’ll find me referring to it as in this post. I could tell you that in this summation on some of the features or mini review (there’s just too much that it does to cover here in great detail) if you will of Serpwoo that it’s absolutely amazing and something that you must have in your arsenal, but that’s going to sound a lot like any other sales pitch out there and I’m not after your money because quite frankly even though my Serpwoo link is embedded in this post, the less people that use the software gives the rest of us the advantage as I’m already one of the VERY early adopters of this product. What can I say.. I know a good product when I see one and this one had too much potential for me to just walk the other way. It is both an online reputation management tool (ORM) that does SERP analysis, website analysis and keyword analysis at it’s core…. for now. I say “for now” because since it’s introduction to the public, there have been frequent and more importantly.. “significant” updates. It goes without saying that the developers know they’re on to something special with this product and they’ve been taking it seriously as more people have signed up for the the SERPwoo experience… an engaged community of raving fans. One feature of SW is that it allows you to very quickly see what your competitors are doing for any keyword. If you want to get the insider information as to how they are doing what they’re doing to move for a keyword, SW gives you metrics that similar software does not. In fact, traditional SERP analysis and website analysis tools don’t come close to the information, accuracy and speed of SERPWoo. Another very unique feature of the software is that if you know anything about traditional tracking tools, those tools allow you to track “your websites”. Obviously, if you own a website, you want to be able to track the keywords and movements for your own webpages. That’s a given and very common, but where SERPWoo is different is that it tracks ALL positions for any keyword that you want to monitor. That is going to tell you a lot more about what’s going on with a keyword than just monitoring what your website is doing with respect to that keyword. Ever since the Google farm showed up and the animals that they’ve been associated with have terrified just about anyone with a website knowing that a penalty could come anytime without any notice, rhyme or reason.. just because the big G decided they wanted to change their algo that day it’s been a rocky world in SEO because as we all know.. Google has all the power, the insight, the knowledge and control to affect the work that you put into your websites. One of the more interesting things about SW, even though there are “several” interesting things about it, is the ability to detect Google updates “before” they happen. If you’re a skeptic, that’s your call, but once you start monitoring keywords you choose and view the analysis grid or the dashboard, you’ll see for yourself exactly what I’m referring to as well. I can only give you facts based upon what I know about Serpwoo, what I’ve seen during the beta, the experiences the developers and other users had in the beta and so on. It’s the real deal and people are recognizing it in a very real way that now you don’t have to just look at a “piece” of data here and there to try to put together some idea as to what Google is going to do, or what your keywords are going to do or what your competition is doing.. The analysis and visually comprehensive information that is at your disposal with SW is unmatched and I don’t say that lightly. Now some of you may still be wondering what in the world was the ORM part of this product. I think the easiest way to explain this is that if you are someone doing work on behalf of a client and you’re in charge of watching or monitoring their niche.. you can enable SW to let you know when there’s new activity within that niche that you’re keeping your eyes on. There’s a lot that can be done with this information especially for those that have struggled to find an easier to way to make monitoring ORM less time consuming and more effective at the same time. With that said, I want to make a statement that has been proven about SERPWoo.. it literally allows you to reverse engineer what your competition is doing within any niche. That’s not to say that it makes it easy as butter to do it, but SW gives you the insight and the power to get the job done much easier than any other traditional analysis tool that claims to have a similar feature set. One of their newer features is the add-on of the keyword finder. Again in speaking with respect to traditional tools, you would typically need to know the keyword that you wanted to track or base a new keyword off of. Most of us would usually use a popular tool like Long Tail Pro or Ubersuggest to find new keyword suggestions. However the huge difference with SW, is that it will pull from the top 10 domains for that keyword and pull all of the top keywords from the websites that have a connection to the keyword that you entered. So you’re not just getting random keywords that don’t matter.. you’re pulling keywords from domains that are ranking on the first page for that keyword that is related to the original keyword you entered and you get to filter that data down even further if you want within the software. Explore keyword volume metrics, CPC, view what your competition is doing and export your data. What’s boggles my mind about this software is that it’s still in it’s infancy and the developers are continuing to send out updates about new features and plans for it’s future. As I eluded to before.. whether you elect to sign up for this and use it is entirely up to you, but this is undoubtedly one of the most exciting products many of us in the SEO community or marketing community have seen in a long time. Some may even call this an unfair advantage in the analysis game, but there’s one thing for sure.. no one’s complaining about the advantages that come along with being a member of the SERPWoo community.